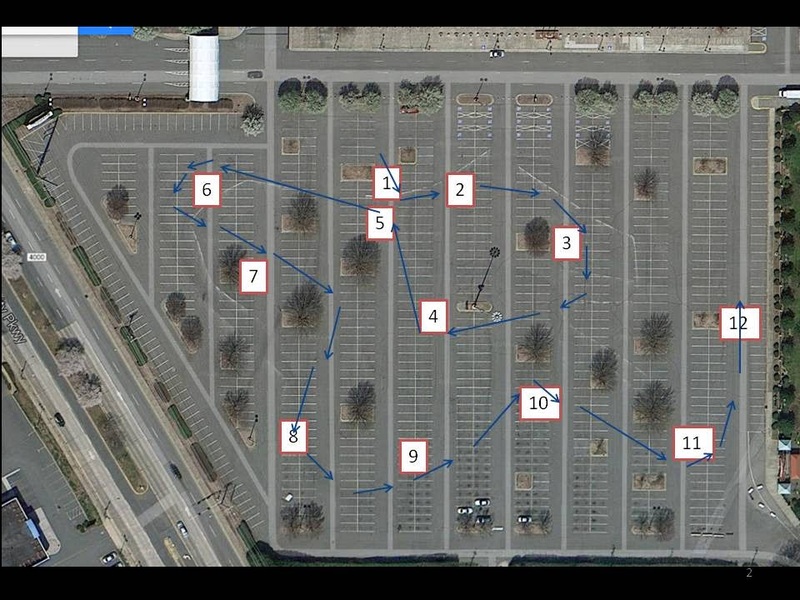 On this basic map, we've numbered the key points of this autocross lay out in one of the parking lots at the LJVM Coliseum in Winston Salem NC that was held on June 15th. Starting at #1 and working thru the finish at #12, let's join the track walk and discuss some basics on how to get around the course. We'll look at some right hand turns, left hand turns, a few elevation changes, and try to make sense of how they all flow together as you plan on how to attack this particular course. 1. We're lined up at the starting cone, looking at the yellow boxes that house the timing beams, so we're going to try and get a clean quick launch and make the first left hand corner while looking ahead to that first cone out there to the left. Walking the course is how we can anticipate how best to do this first maneuver, based on what is coming after it. Now we're rolling and we're turning left thru the timing lights (in the yellow box here), and looking ahead to the next cone. You can see one upright cone that we don't want to hit, and the "pointer" cone next to it that tells us to pass the upright on the right side. After that, we'll pass to the left of the next cone, since it has a pointer also. GAS GAS GAS! 2. So we're up to the first pointer in the foreground, and looking ahead to the next pointer cone. These are not too close and since we've just started our speed probably will let us go flat out thru here. After that 2nd pointer, you should be able to see a series of cones that will make up a sweeping right hand turn. 3. Coming into the right hand sweeper, we'll try to drive a smooth line arcing around to get past that 3rd cone in the upper right, which will set us up for the next section. Ideally, as we're driving we aren't focusing on each cone as we come to it, but looking ahead to the most important one coming up. 3. Now we've reached that last pointer in the sweeper, and looking ahead to a bit of a straight shot that leads to a hard right hand turn. If we've got the car pointed in the right direction here, it's back on the gas! 4. As we approach the closest cone with the pointer, we are HARD BRAKING in an effort to go slow enough to get around the cone without hitting all those other ones, but also to make the turn smoothly as the weight of the car shifts, so that when we get back on the gas we won't slide all over the place. Smooth is fast. 4. OK, we just got around that right hander, and have come to the longest section (so far) that we'll be on the gas, so we're trying to look ahead to see what is coming up, remembering the layout from the course walks. The next move will go to the left up ahead, but it's a gentle turn so we'll be staying on the gas here. Off to the right a bit, you might be able to see the starting point and the yellow timing boxes. Don't go that way! 5. Still on the gas here, and we're heading to where those two other folks are walking straight ahead. GAS GAS GAS! Now we're getting close to a tight left hand hairpin, so it's probably time to really get on the brakes, and slow the car before the corner so that we can get back on the gas sooner. For me, I think of hard braking as the opposite of every day driving where I'm trying to be smooth and very safe, so I have to remind myself to really get on the brakes. The two folks walking have made the turn so you can see it's a tight one. 6. Just after the hairpin, still turning the wheel but now on the gas, here comes a fast section of the course. It might be hard to see from the photo, but live and in person as you walk it (more than once), you can easily figure out WHERE to go, and then start figuring out the details of HOW to do it!. Here, we're speeding up to make a right hand sweeper that goes into a downhill part, so it's getting faster! We'll split those two trees and then go right! 7. Just past those two trees now, and we're turning right, gently curving to the right some more down to the bottom of this section.This part should be fun since the corners aren't too tight, so we'll be trying to get the maximum speed while keeping the car under control. 8. This is at the lowest section, and we're now shifting from the gradual right turn to get here, to now start a long and fast left turning sweeper that will start going back up the small hill. Some autocross courses are very flat, and that's fine, so this extra added attraction with just a little elevation change mades it very challenging. Now that we've gotten around this corner cone (and pointer), we are really on the gas and headed for fun in a long left hander. 10. At the tail end of the long fast sweeper, now we're going up hill and headed for about a 90 degree right hand turn, so this is some hard braking. On this corner they've marked it with TWO pointer cones, and you certainly don't want to miss this one! If you go straight here, (instead of turning) you can see that you'll hit that row of cones. Ever upright cone you knock over adds 2 seconds to your time, so you really don't want to hit them! I think the photo is taken from where I'll want the car to be, so I'm not sure what the other guy walking is doing over there. Maybe he thinks that will be the fastest place to be? After the first run thru there in the car we should be able to figure that out. After this turn, only one more left hander before the finish, so don't blow it here! Whew! Just made that evil right hander, and now it's back on the gas on a short downhill to the final left hand corner. I don't know how many different ways there would be to drive even one part of a course like this, but hopefully we're figuring out some of the key points and how to get around a bit faster every time we drive. Here we go, down the hill, thru the two rows of cones, and then to the last corner! 11. After that short straight, we're now turning left past this pointer, and headed up hill just a bit to the finish. Trying to carry a lot of speed thru here will pay off in being able to add the power all the way to timers at the end. OK, the finish line is dead ahead, those yellow boxes with the timers are up there, trust me! Just keep the speed up thru the finish and then come to a safe slow down to go make another run. We'll get 4 runs on this course, so after each one we'll be thinking thru what sections we could do better and gain more time. This was just a short version of some of the thinking that goes into driving an autocross, so I hope if you enjoyed walking thru the course that you'll tune in next time when we'll show the video of driving it at speed. Brian has a cool way of lining up our two fastest drives, and we can see different sections where we each were faster or slower than the other at different times. I don't know what Brian thinks of that, but my plan is to steal all his speed secrets!